"My sincerest thanks for doing such an outstanding job on my crown. I had it inserted today and the coloring was perfect. There were no adjustments necessary for the bite. I have never had a crown that looks and feels this great!" Our Full Porcelain Crowns have a 3M LAVA Zirconia substucture and we use Noritake porcelain to sculpt the crown. In a study published in CRA Foundation Newsletter, November, 2006, Noritake porcelain was the only porcelain showing no surface degradation after 1 year. The study also proved no breakage or delamination. Retention was 100% and margin fit and aesthethics were clinically the same as PFGs. Again, we stress materials here. 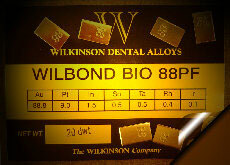 We use a Palladium free 88% gold alloy, which means no adverse tissue reaction. We sculpt our crowns with Finesse Low Fusing Porcelain by Ceramco. It is 78% less abrasive to the opposing dentition then traditional porcelains and has a lovely pearlescent effect, creating life-like restorations.